What If Ancient Rome Had Internet? This Is How Social Media Could Have Looked….Feel Free to Add Your Own! Buy the latest Roman Gazette Bestseller list scroll “De Bello Gallico” by Gaius Julius Caesar now! 15% discount if you order before the Ides of March. Sword used to kill Gaius Julius Caesar. Features original blood stains. Only used once for murder. Condition: fair. Current bid: 100 dinarii excluding shipping. 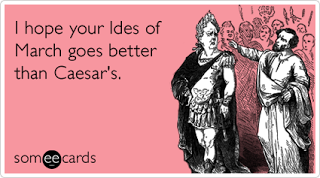 “Why does oracle4u keeps texting me “Beware of the Ides of March” (bewildered I am NOT bold Caesar to his mistress).